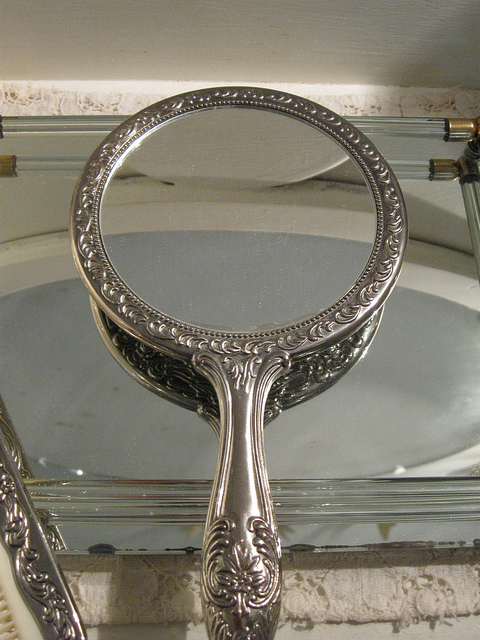 Mirror Moments in Fiction: Does your story have one? I’m currently reading James Scott Bell’s “Write Your Novel from the Middle,” which I can’t recommend highly enough. It has me looking at my current WIP from a whole different angle. photo by Catie Rhodes, WANA Commons. Virtually all books on craft approach it as another “plot” point. Something external happens that changes the course of the story. But what I detect is a character point, something internal, which has the added benefit of bonding audience and character on a deeper level. As I revise one story and begin another, I’m keeping Bell’s words in mind. Thinking this way has forced me to look beyond plot points and identify that one magic moment, building the story around it and deepening the story. If you write fiction and haven’t read this book yet, I would recommend you check it out ASAP. Finish a second draft of my novella “Good Old-Fashioned Magic.” Revised one chapter. I still have some dialogue work to do in that chapter, but it’s mostly revised. Also made another attempt at a “blurb” for this manuscript. Write a first draft of another novella. Wrote part of one scene in a notebook. Also created a very rough outline for this story. Read a minimum of four books on the business or craft of writing. One of four books read. Continued reading “Write Your Novel from the Middle” by James Scott Bell. Check in on Twitter daily. Not met, though I have been checking in on Facebook. Comment on three to five blogs per day, Monday-Thursday. Met for Tuesday, not for Monday. Can you identify the mirror moment in your story? What bit of writing advice changed the way you looked at your manuscript? I will have to get Mr. Bell’s book. It sounds very helpful. I know the mirror-moment in my WIP, but I think that I need to make it stronger, bolder. Know what I mean? Keep up the good work on your goals! I highly recommend it. It definitely helped me with my WIP. I have a mirror moment, but I’m not sure it’s close enough to the middle of the story. I might have to do some rearranging of the scenes. Oh I’ll have to check that book out. I’m glad I can pinpoint the mirror moment in The Book but I hadn’t really thought about quite like that before. I’ve always outlined stories to within an inch of their lives and someone suggested I try to relax that a bit, and leave space to see where the story takes me. Best change I’ve made in my writing by a long way! I used to be a full-out pantser, but my first drafts were an absolute mess. I’m coming from the opposite direction; I’ve learned to do some outlining before I begin so I have some idea of where the story is heading. Moving toward the middle–whether pantser of plotter–can help us grow as writers. I’m glad to hear you’ve found an approach that works for you. I’m glad you found it helpful. Bell also goes into much more detail in the book. Yes. It seems like such a simple concept, but it’s a huge help when thinking about our books. It can be used at any stage, but I’m finding it most useful with a story I’ve just started. I’m putting more time in planning and making that mirror moment possible before I even set fingers to keyboard and get the story onto the page. I love the 14 plot points he uses. So many helpful tips in such a small book! Me too. I like the triangle–the pre-story, the mirror moment, and the transformation. It’s helping me so much with the story I’ve just started. Bell’s book was a quick read, but super-helpful! All right – I’ve been putting it off, but I think I’ll be buying some of his books over the next months, as I move through the first revision pass of Chameleon’s Dish. I’ve got several more drafts awaiting revision, and more being created – and these books sound intriguing! If you’re getting ready to revise, I would recommend Bell’s book “Revision and Self-Editing.” It totally saved me from drowning in the revision process. Thanks, Shan Jeniah. If you’re ever looking for pictures for your blog, the WANA Commons group on Flickr is fantastic. It’s all writers sharing their images for other writers to use on their blogs–as long as you credit the group and the photographer. There are lots of images to choose from, too. Thanks, Denise! I bought it, and it’s waiting on my Kindle. Once I settle into the August routine, I’ll read it. I’m going through each scene individually, and not in sequence, first, using Rock Your Revisions. Then, before setting it aside for a while, I’ll be reading through and making notations for a sequential pass. I think this book will be perfect for that. If I like it, I’ll probably be adding other of his titles, too, over time. I read Rock Your Revisions earlier this year and found it helpful. I hope you enjoy Bell’s book. All of his writing books are amazing–some of the best out there, in my opinion. I love WANA Commons. The quality of the images is amazing, much better than other free stock photo sites, and I like that I can trust the content. That sounds like a wonderful book to read. Even just the little bit that you summarized has me thinking about my WIP a little differently. Thanks! And good work on your goals. I hope others find it as useful as I did. I’m definitely approaching my stories from a different angle now. I’ve wanted to get James Scott Bell’s book since first hearing about it. I have and love Plot & Structure, so was pretty sure I’d like this one, too. I can see a mirror moment in the story I’m writing… even if I haven’t written it yet. I loved it, and I’ve gotten a lot out of all of his books. “Revision and Self-Editing” and “Conflict and Suspense” were also great. It’s awesome that you’ve already identified the Mirror Moment in your story. That should make the writing process a lot easier! As for mirror moments, you’ve gotta be careful not to stray into cliche. I say this after hearing several manuscripts that started with the main character looking into the mirror. This was at the DFWcon Gong Show, where a panel of editors and agents listen to the first page of a novel and then hit the gong when they would have stopped reading. They unanimously said opening with your character looking in the mirror was a cliche they saw daily. I won’t even mention the groans! Does Bell address this? Since he’s suggesting the mirror moment at the midpoint, I’m betting he has thought this all through. I haven’t read Bell’s book, but you’ve intrigued me! It’s not so much about looking in the mirror as it is taking a moment to reflect on the circumstances of the plot and figure out where he/she stands, asking questions like “Who do I need to be to overcome the obstacles I face? Who am I now?” So there’s no literal mirror needed–it’s more of a metaphor for a point at which the character turns inward for reflection.